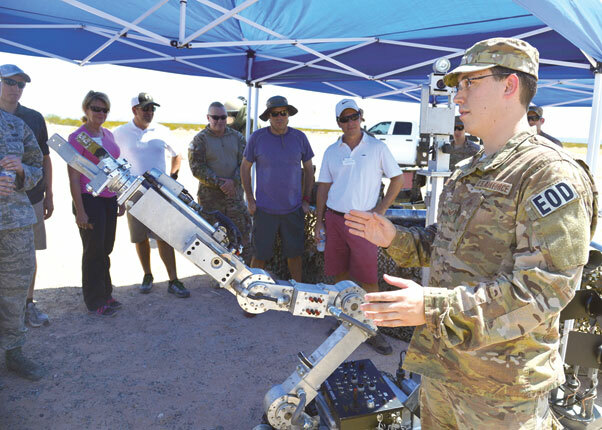 Senior Airman William Langston, 56th Civil Engineer Squadron Explosive Ordnance Disposal technician, briefs business and government leaders from the community who have been selected as honorary commanders at Luke Air Force Base on how the robot functions Aug. 31 during a tour of the Barry M. Goldwater Range, Gila Bend Air Force Auxiliary Field. The honorary commanders observed how the range is used on a daily basis to help achieve Luke’s mission to train F-35 Lightning II and F-16 Fighting Falcon pilots. 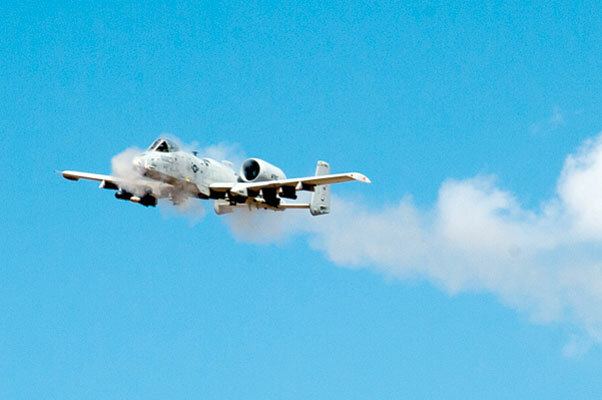 An A-10 Thunderbolt II from Davis Monthan Air Force Base fires its 30mm gun Aug. 31 during a training mission at the Barry M. Goldwater Range located in Arizona near the Mexico-U.S. border. 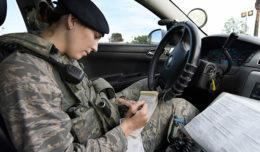 Honorary commanders are civic leaders who are partnered with squadron commanders to share experiences in each other’s workplace and build relationships in the community. Honorary commanders learn more about the Air Force, Luke AFB, its mission and its people. The group saw night flying operations, bombing runs, and strafing maneuvers performed by A-10s and F-16 Fighting Falcons from Luke. 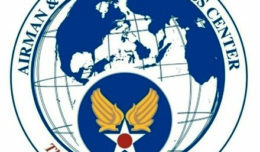 The BMGR is the nation’s third largest tactical aviation range and is essential for developing and maintaining the combat readiness of the U.S. Air Force, Marine Corps, Navy, Army and allied forces. Since the beginning of World War II, the range has contributed to the nation’s defense and air power superiority by accommodating rapidly changing training requirements for combat capability.